Hearts, stars, and chocolate! Oh my!!! 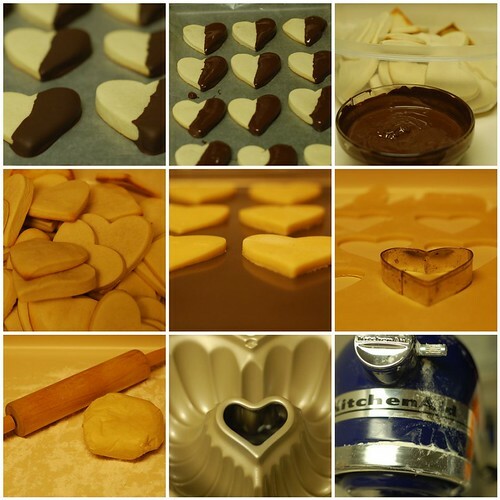 I have been making the Half Hearted Valentine Cookies for many years now and every year, I learn something new. This year, I learned that the thicker cookies hold up better and are easier to release from the cookie cutters. The thinner cookies are harder to pick up and put on the cookie sheets. They also brown faster than the thicker cookies. You notice there are a few star shaped cookies too! I got a set of star shaped cookie cutters on clearance at Crate and Barrel right after Christmas. Enjoy!!! 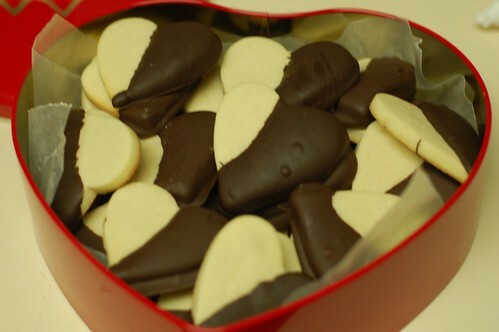 The Half Hearted Valentine Cookies have become my most popular cookie outside of the Christmas holiday season. It has been a few year since I have made them and I learn something new each time. For this batch, I made cookies a little thicker. The thinner cookies brown on top too quickly. Enjoy! For cookies, in large mixer bowl, combine all cookie ingredients except flour. Beat at medium speed, scraping bowl often, until light and fluffy. Add flour; beat until mixed. Divide dough into halves. Wrap in waxed paper. Refrigerate until firm, at least 2 hours. Heat oven to 375. Roll out dough on lightly floured surface to 1/4-inch thickness. 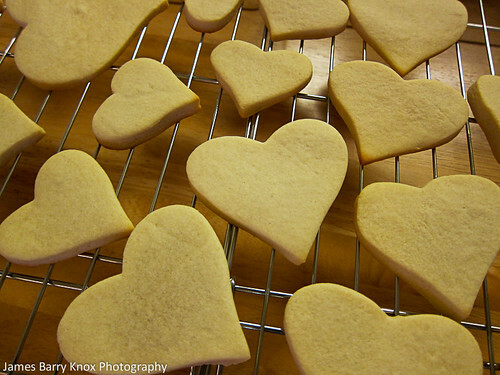 Cut out with floured heart-shaped cutters. Place 1 inch apart on ungreased cookie sheets. Bake for 7 to 10 minute, or until edges are very lightly browned. Removed immediately; cool completely. For glaze, in small saucepan, melt chocolate and butter, stirring occasionally over low heat until melted, 4 to 6 minutes. Dip half of each heart into chocolate. Refrigerate on waxed paper-lined cookie sheet until firm. Store, covered, in refrigerator. Makes about 3 1/2 dozen cookies. This recipe comes from the Land O Lakes Cookie Collection. The glaze was a bit of a challenge for me because I could not get it smooth enough. I used Baker’s Dipping Chocolate for dipping the cookies and it worked great. Get 3 to be on the safe side. Heat up two and pour them into one container. This way your chocolate will be deep enough to cover half your cookie. Cream cheese is sold in 3 ounce packages but you do not see it in the stores very often so I cut 3 ounces off the 8 ounce silver brick. You can save the rest for bagels. 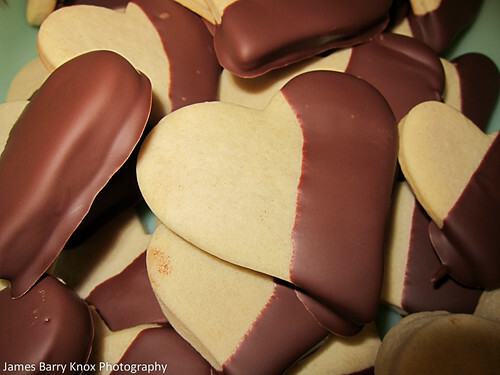 You are currently browsing entries tagged with half hearted valentine cookies at Simply J Life.